For some Florida orange growers, Hurricane Irma did more than destroy crops. It wiped out the best growing season in ten years. This was supposed to be a comeback year for the citrus industry, which has suffered years of declining production. Nearly all of the oranges grown in Florida are used to make orange juice. "We were really excited about this upcoming crop," Ned Hancock, owner of Hancock Citrus in south-central Florida, told CNNMoney. "This was going to be the first improved crop that we've had in a decade, really." Growers have been struggling since 2004, when four hurricanes ripped through Florida, washing away much of the year's harvest. Then the industry was hit by a crop-killing disease that spread like wildfire. Last week, Irma decimated broad swaths of crops across the state. The damage is still being surveyed, but experts say the impact will be severe. Ned Hancock owns a citrus farm and serves as a commissioner for the Florida Department of Citrus. 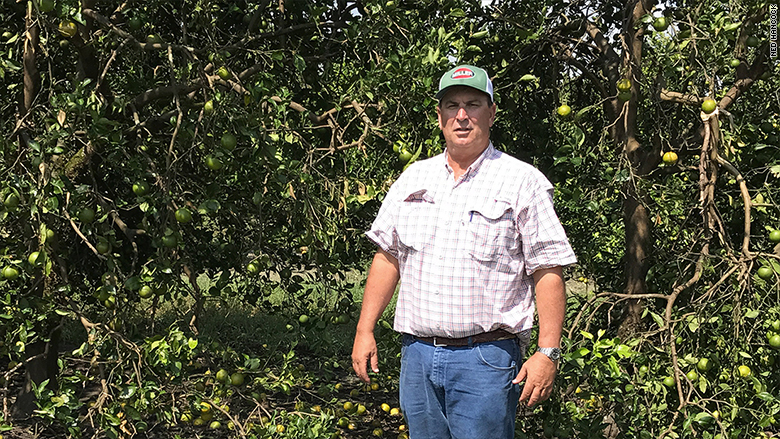 Hancock comes from generations of citrus farmers, and he's been in the business about three decades. He says Irma's destruction is the worst he's ever seen. It hit the entire state, he explained, unleashing fierce winds coast to coast that toppled trees and ripped unripe fruit off their limbs, leaving them worthless. After an initial walk-through of his groves on Wednesday, Hancock estimated he'll only be able to harvest about 50% of his crop. And that's only if flooded areas drain before the water begins to rot tree roots. What's particularly gut wrenching about all of it, Hancock said, is the idea that a storm could put some growers out of business. "In most industries, there's no downsizing if you're doing things right," he said. "But in this case, it's just mother nature coming in, and it doesn't matter how good you are...It's been hard, it's been hard." 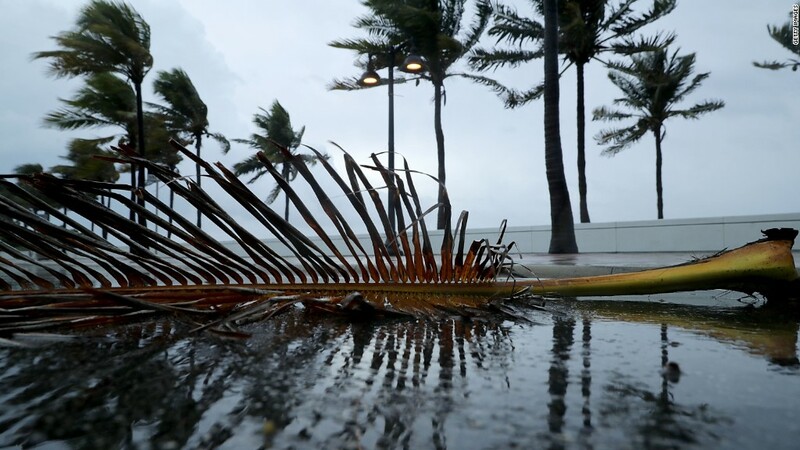 Florida growers are no stranger to hardship -- their annual orange production dropped from 242 million boxes a year to 150 million boxes after the 2004 storms, Shannon Shepp, head of the Florida Department of Citrus, told CNNMoney. Then in 2005 the industry was hit by a disease called citrus greening that leaves fruit bitter and inedible. That's cut orange production by at least half over the past ten years. In 2016, only 69 million boxes were harvested. But this year, things were looking up. "We were seeing a stability level that we haven't seen in many years, thanks to some of the things we've been doing to mitigate against [citrus] greening," Shepp said. That's important, since Florida's citrus industry is worth about $8.6 billion and employs 45,000 people. She said an early estimate for 2017 put the harvest season at 75 million boxes -- 6 million more than last year. It would be the first production increase since the 2007-2008 harvest season. One decade. But then came Irma, and now, Shepp says that lucky farmers will likely get to harvest about a third of their crops. "That's what's so disappointing about [the hurricane]. We've been fighting this greening for 10 years," Hancock, the farmer, said. "We feel like we've won a little victory, and it's just a deflating feeling to ride through these groves, where you can see you had a great crop of fruit, but it's all on the ground." He said he doesn't expect to have another "normal" harvest until 2019 at the earliest, at which point farmers can try to recoup some of their losses. And it'll take four to five years before newly planted trees will bear fruit ready for harvest. For the time being, Hancock says he's focused on "figuring out a way to stay in business." One lifeline he's hoping for: Money from the U.S. Department of Agriculture, which issues payouts to producers whose output is curtailed by a natural disaster. Hancock says he got some disaster relief from the government after about half of his harvest was obliterated in 2004, after hurricanes Charley, Frances, Ivan and Jeanne struck Florida. "It really proved to be extremely beneficial," he said. The USDA says it's anxious to help. The agency said in a press release Wednesday that it's loosening some application rules for federal assistance to give farmers easier access to relief funds. Whether it's enough to keep him in business isn't clear, but Hancock says he's cautiously optimistic. "We're tough people. We'll find out some type of way to keep going," he said, pausing before adding, "I hope."